There are only a couple of days left for Rhapsody. This is a must-visit event for music lovers… whether your love is rock, jazz, metal or country (amongst others) you’ll be sure to find something to love at this event. I was inspired by Coquet’s County Rd 22 dress and Blake Shelton’s new song “My Eyes” in creating this look. The prop pose is from Embody’s Country Girl set, and I had to blog it because I begged Rad to do this pack. Both the Coquet and Embody are in the Country genre at Rhapsody. My adorable wedge heels are fri.day for Summerfest, which also ends this weekend. I knew I needed a skin with dramatic red lips for this look, to go with the line “red lips like wine, wanna drink them up” from the song. When I saw PXL’s Mia in the Jazz genre at Rhapsody I fell in love with it. I originally grabbed one with peachy, summery makeup, but then went back for the version you see below, with the luscious red lips. You may have heard there’s this little gacha event opening in two days. It’s called The Arcade. Yeah, I’m joking. You have to live under a virtual rock to not know about this one! The shopping guide doesn’t appear to be live yet, but check the site again soon because I’m sure it will be public before long. 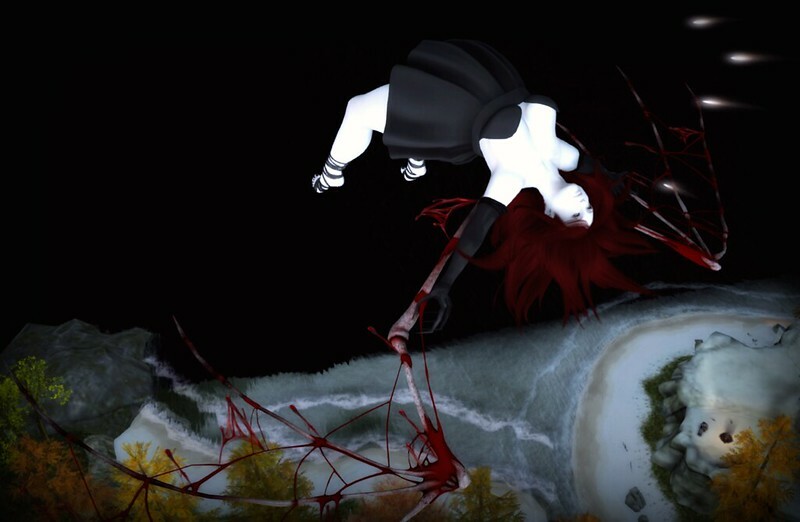 In the meantime, check out Tableau Vivant’s awesome Arcade release. The Longfall hair, complete with Mermaid headdress, is ultra dramatic, and perfect for fantasy/RP type pics. I love the cascading waves. I decided to take the opportunity to actually be a mermaid. 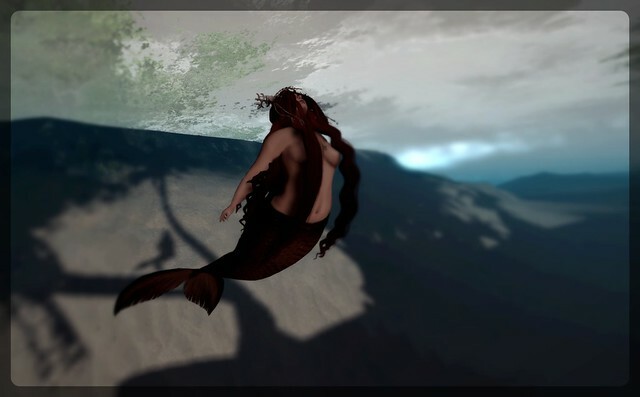 I found this beautiful mesh mermaid fin on Marketplace. Here’s a different angle, to show you the beautiful headpiece. I’m wearing one of the rare versions, Kelp. My pretty skin is from Essences, available at The Dressing Room Fusion right now for just L$70 (note: I’ve edited the eyemakeup on this to be more a bit more dramatic, but the skin is stunning so go demo!). And because the title of the first pic (Surfacing) put Sarah McLachlan’s album of the same name in my head, I leave you with this. This will probably be my last post I can squeeze in before we leave for New York/New Jersey… see ya on the flip side, and have fun at The Arcade when it opens! I’ll have to wait until I return.